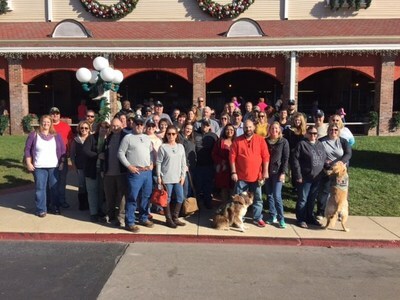 BRANSON, Mo., Dec. 22, 2016 /PRNewswire-USNewswire/ -- A group of injured veterans and their spouses were treated to the ultimate "dinner and a show" date experience during a recent Wounded Warrior Project® (WWP) program event. The couples enjoyed a four-course meal at Dolly Parton's Dixie Stampede® as they connected with fellow veterans in their community. While participants dined – without utensils, per Dixie Stampede custom – they enjoyed a holiday-themed live-action show, featuring more than 30 horses, trick riders, stunts, and musical performances. Dustin Baggs, a retired Army combat engineer, said he and his wife were excited about the opportunity to attend the connection gathering. Having gone through five surgeries in the past year, he said it was a welcome chance to get out and enjoy each other's company, as well as the companionship of fellow warriors. "The show was great, and enjoying it with other veterans made it even better," he said. "That's what makes these events so important – that continued camaraderie and support, knowing there is still life – and help – after being in the service." These connection events support the long-term recovery needs of warriors by reintroducing them and their families to the unique bonds experienced during military service. In a WWP survey of the injured warriors it serves, more than half of survey respondents (51.7 percent) talked with fellow Operation Enduring Freedom, Operation Iraqi Freedom, or Operation New Dawn veterans to address their mental health issues. "I am very interested in mentoring veterans through Wounded Warrior Project's Peer Support program, so I like to go to events and meet warriors any chance I get," Dustin said. "Building those relationships is important, and it could save a life." Participating in the Peer Support program, which is dedicated to ensuring injured veterans, their families, and caregivers support one another in recovery, is one way Dustin said he feels he can provide assistance to an organization that has helped him so much in his healing process. "Wounded Warrior Project has helped us with financial hardships and other issues through resources like Warriors to Work®," he said. "More than that, we've gotten moral support. It's hard to put into words what the organization means to me." Before the show, WWP staff members interacted with the couples, advising them of additional programs and services to assist in their recovery processes. The programs help injured veterans with mental health, physical health and wellness, career and benefits counseling, and connecting with other warriors and their communities. Through the generosity of donors, these beneficial resources are available to injured veterans and their families at no cost to them.